DETROIT – Single-session tickets for the 2019 U.S. Figure Skating Championships will go on sale on Friday, October 5 at 10 a.m. The 2019 U.S. Championships will be held January 18-27, 2019 in Detroit, Michigan. All junior and championship level events, 15 single-sessions in total, will be held at Little Caesars Arena from January 22-27 and all novice, intermediate and juvenile events will take place at the Detroit Skating Club in Bloomfield Hills, Michigan from January 18-22. Single-session tickets (starting at just $20) go on sale Friday, October 5 at 10 a.m. and can be purchased at 2019USChampionships.com, 313Presents.com, Little Caesars Arena XFINITY box office and Ticketmaster.com. To charge tickets by phone, call 800-745-3000. Discounts are available for groups of 10 or more by calling 313-471-3099. Admission for novice, intermediate and juvenile competitions will be available for purchase at the Detroit Skating Club beginning January 17. All-session tickets and weekend packages will remain on sale. U.S. champions will be crowned in ladies, men’s, pairs and ice dance at the senior, junior, novice, intermediate and juvenile levels of the U.S. Figure Skating competitive structure. The U.S. Championships, which serve as the final qualifying event to make the U.S. World Figure Skating Team every year and the U.S. Olympic Team every four years, annually attracts more than 1,700 athletes, coaches, officials and media to the host community and is estimated to generate more than $18 million in local economic impact. 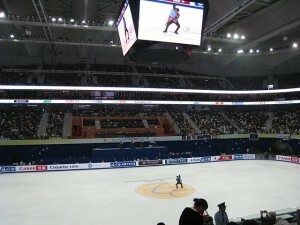 The event will also feature 16 hours of live coverage on NBC and NBCSN, as well as full event coverage live on the Figure Skating Pass on NBC Sports Gold. For more information about the 2019 U.S. Figure Skating Championships and ticket information, visit www.2019uschampionships.com.